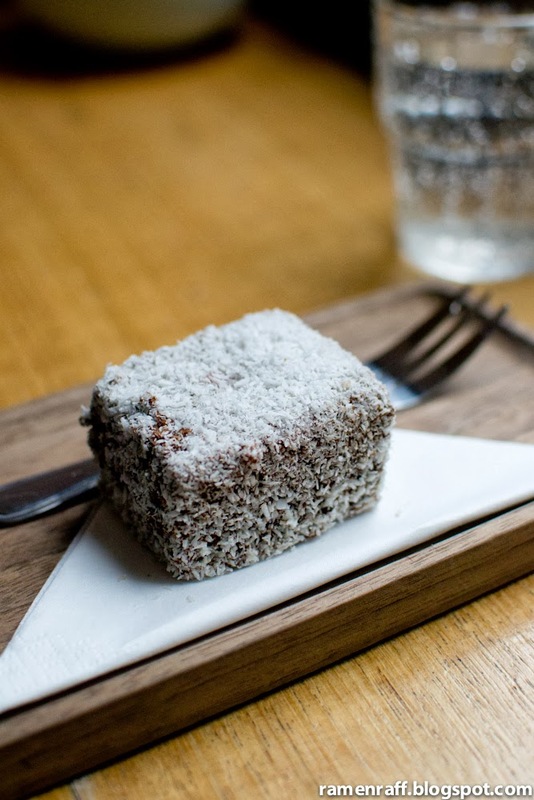 Sydney's Good Food Month comes to a close. 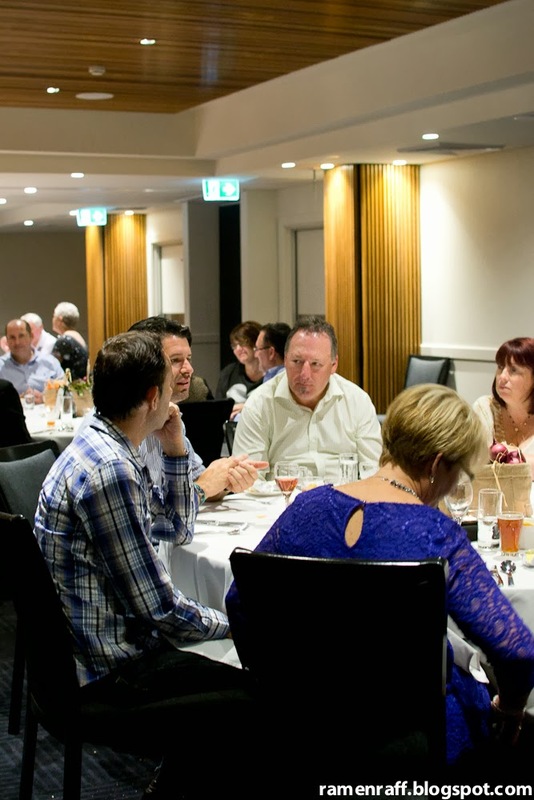 But before the festive month of food ends, Campbelltown Catholic Club brought Good Food Month to the Macarthur area. 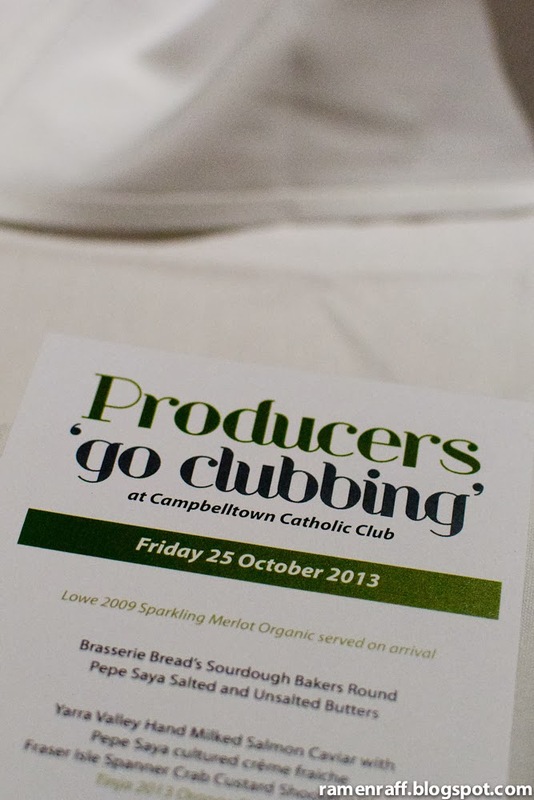 Macarthur 'Foodies' celebrated and dined alongside with some of Australia's top food and beverage producers at an event called Producers "Go Clubbing". 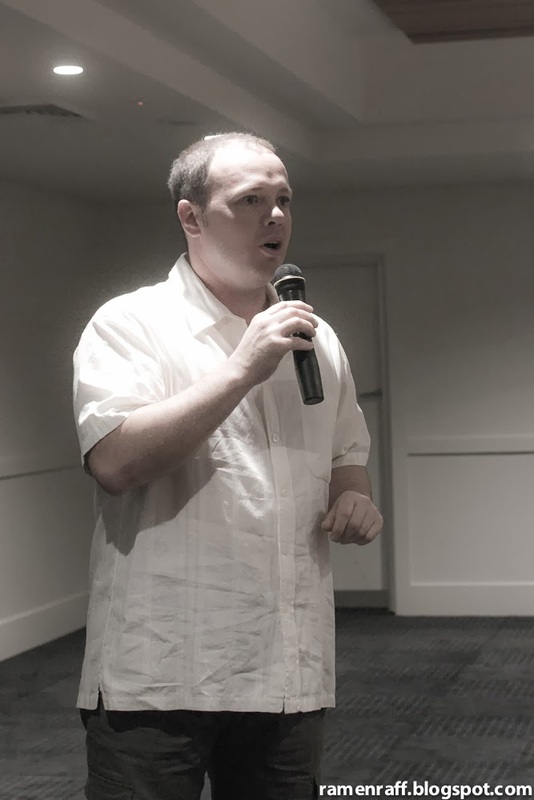 It was a night of celebration, recognition and education. 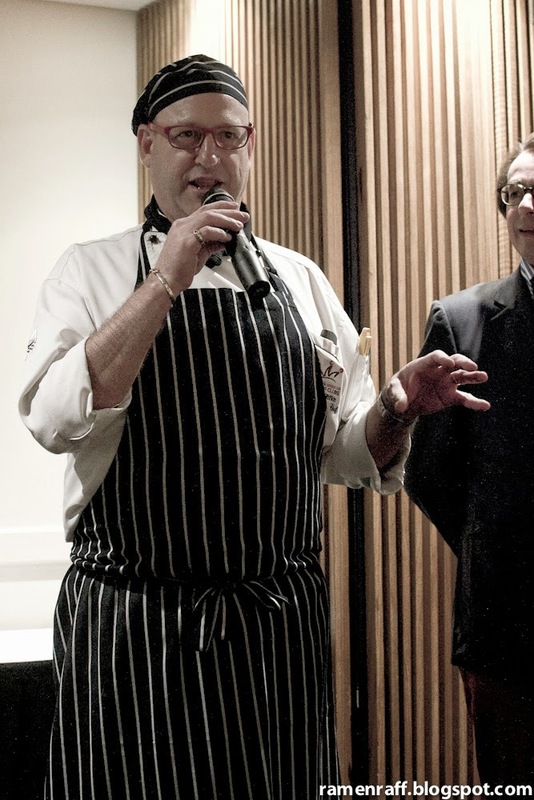 Food lovers and producers gathered to celebrate food and the achievements of the producers that attended. 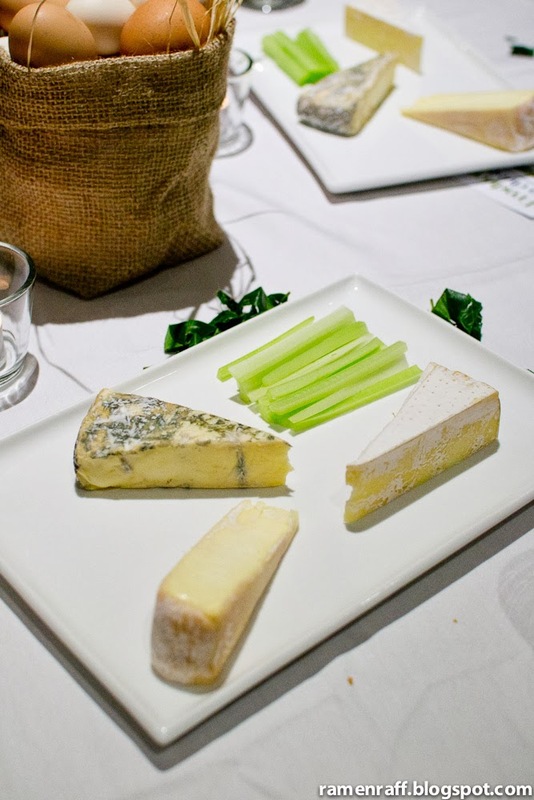 Producers such as Brasserie Bread, Pepe Saya Butter, Country Valley Milk, Fishtales, Vic's Meats, Young Henry's, Dessertmakers, and Lowe Wines were amongst the guests of honour. 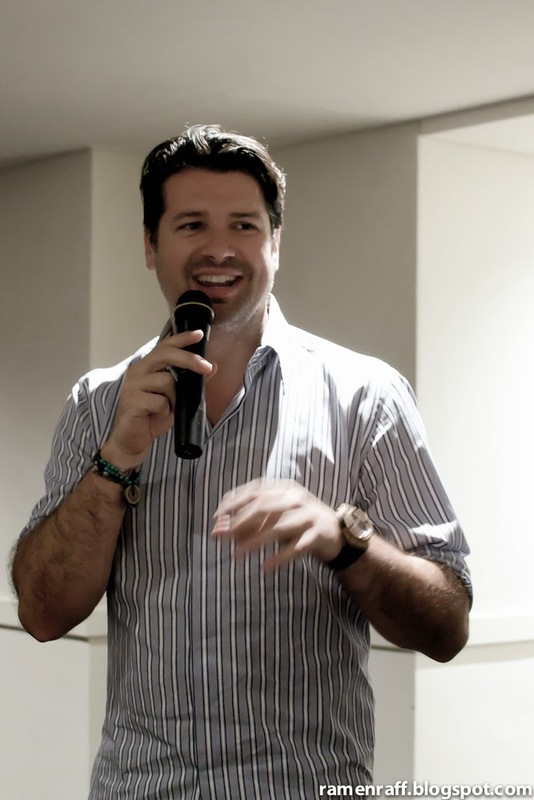 Their passion and dedication can be seen in their top quality products. 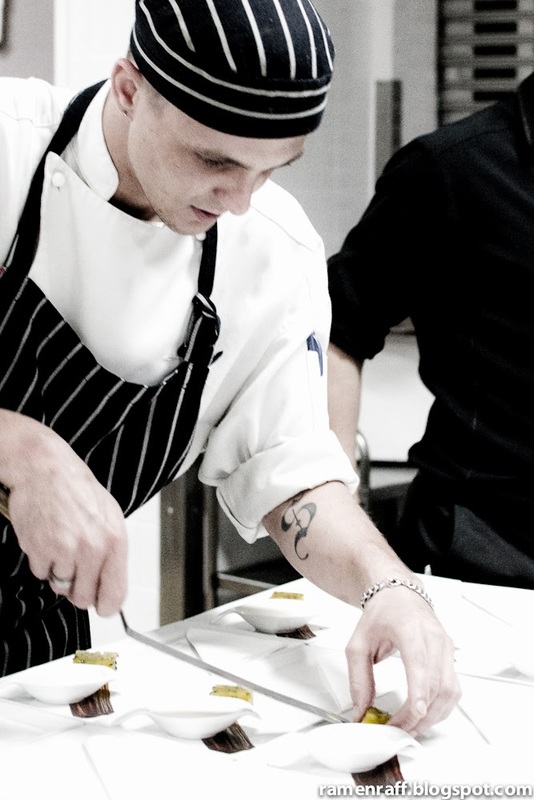 Top quality produce requires a chef of high calibre to utilise the best elements these products have to offer. 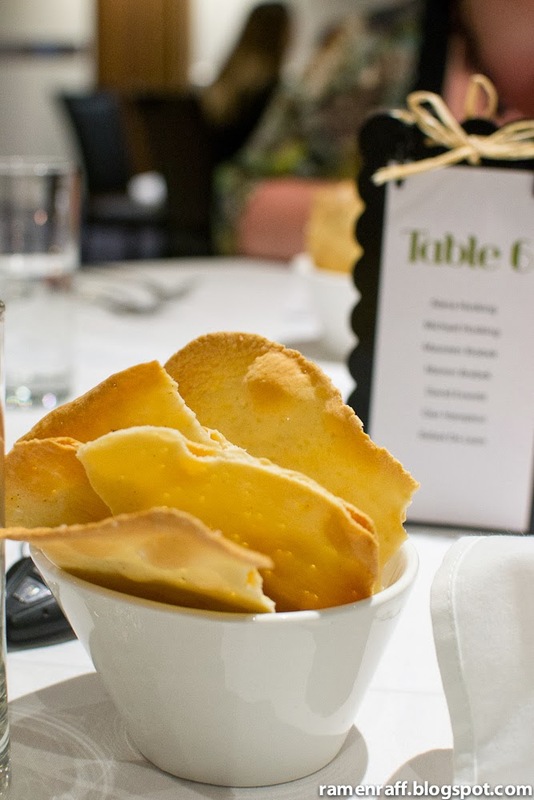 This is where Executive Chef Paul Rifkin (Campbelltown Catholic Club’s Executive Chef) comes in. 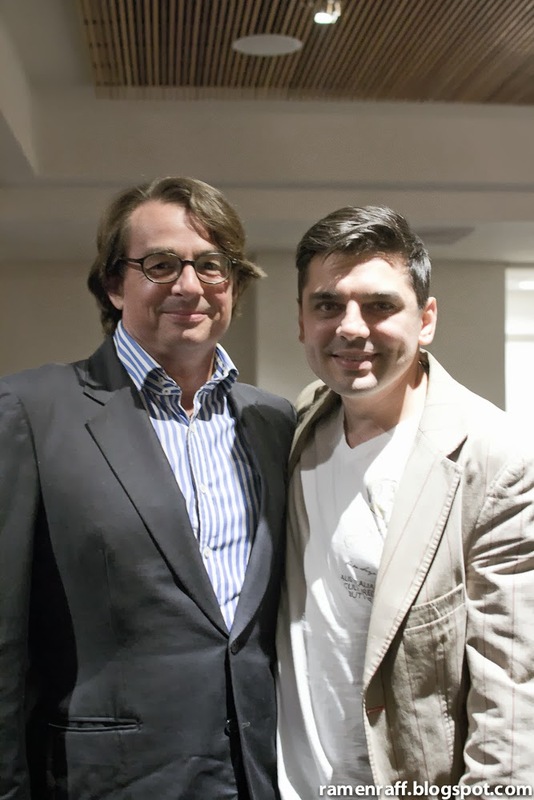 He took the food and beverage products and transformed them into a world-class 8 course degustation. Throughout the night, the producers educated us with the magical background and process that the products went through. 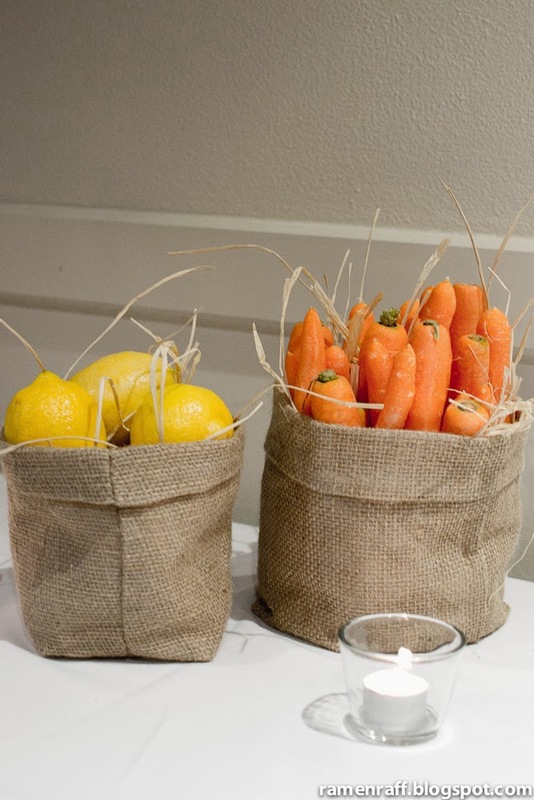 I say magical as the produce and dishes were mind blowing. 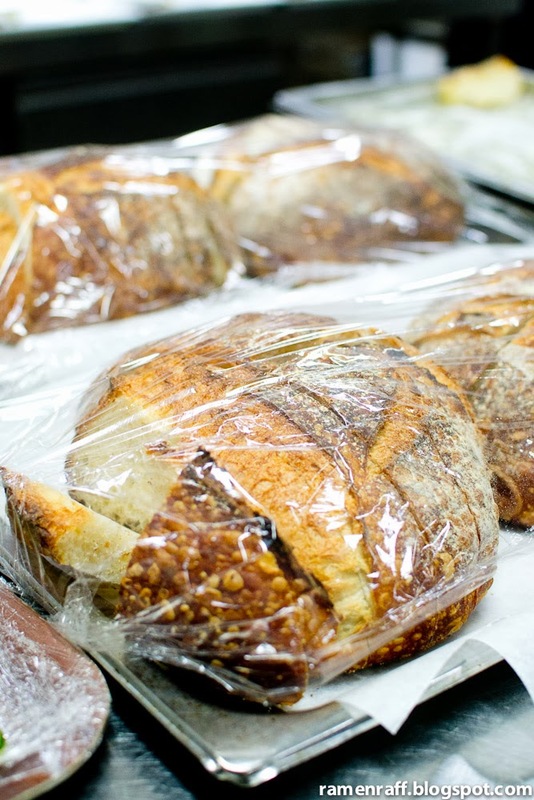 Brasserie Bread's sourdough bakers round and Pepe Saya's salted butter. 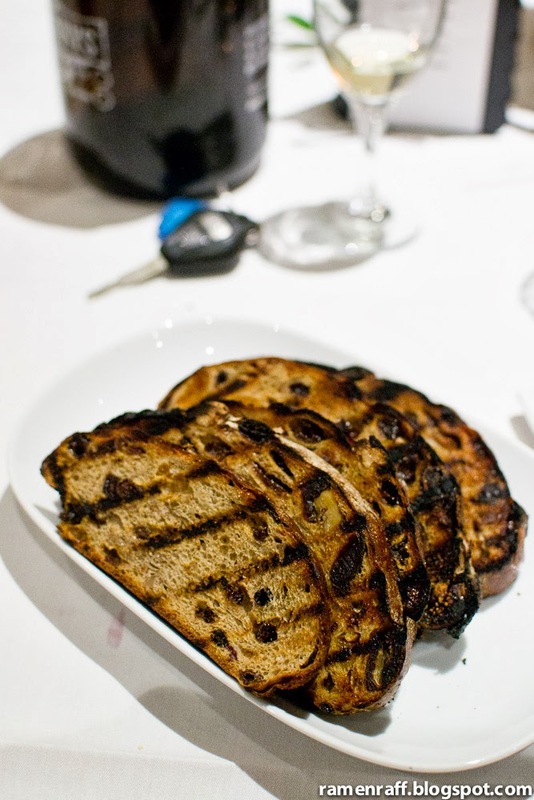 Brasserie Bread sourdough bread and Pepe Saya's salted butter is a match made in heaven. I could have this combo all day and all night. The finest amongst top grade bread and butter. 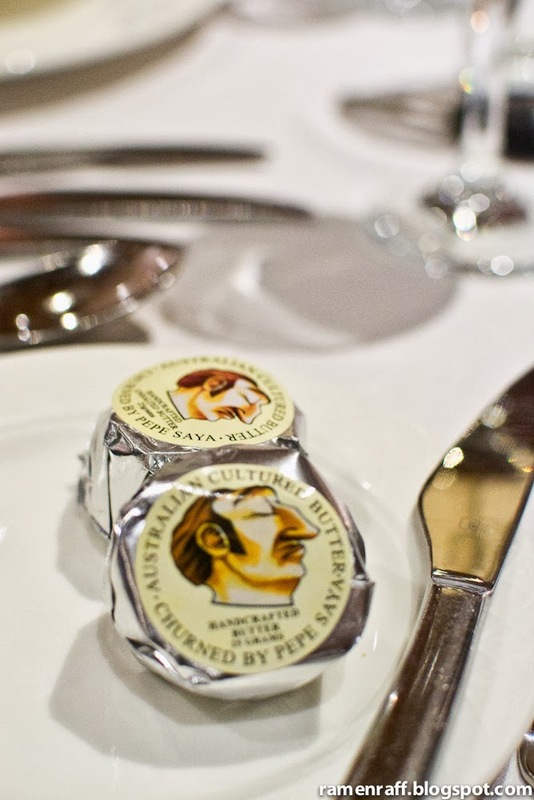 Pepe Saya butter is made with Country Valley creme fraiche. The 8 course degustation started with a Yarra Valley hand milked salmon caviar with Pepe Saya cultured creme fraiche, Fraser Isle spanner crab custard shooter with dill. 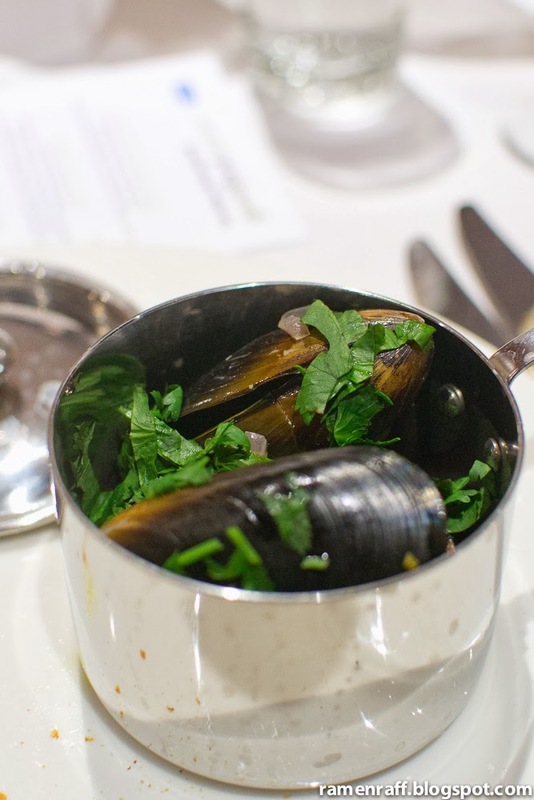 It was then followed with Port Lincoln Kinakawooka mussels with mild chilli, lemongrass and corriander. Mussels were cooked well in a reduced white wine broth. The Ranger's Valley 300 day grain fed Black Angus eye of rump tartare was exceptional! 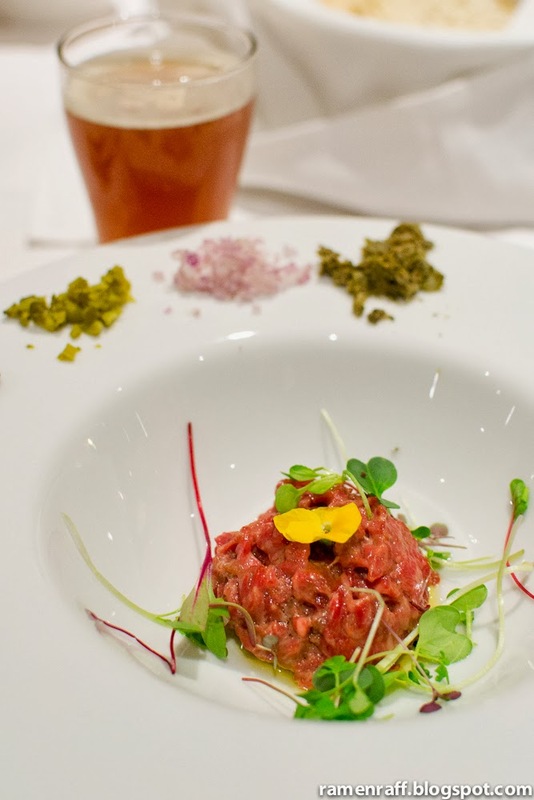 Rump cut was used to give the tartare extra flavour and nice texture. 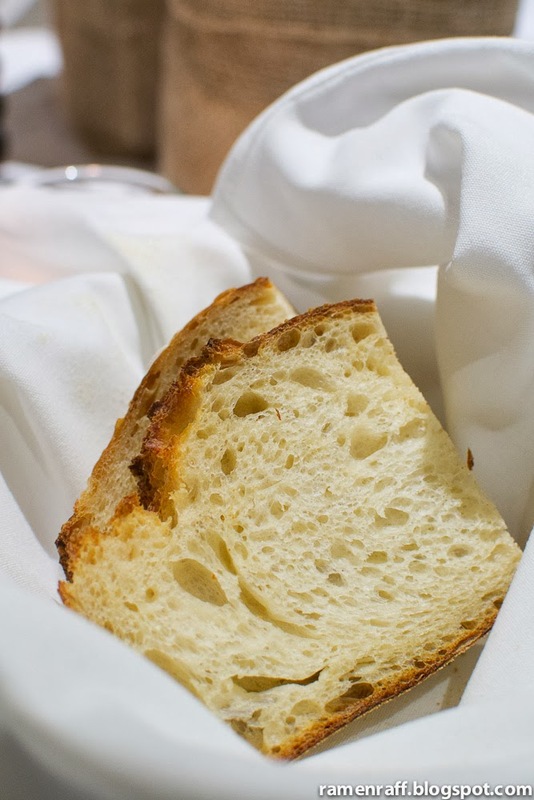 It was accompanied with Brasserie Bread's crispy Pane Crocante to give the dish a wonderful contrast. 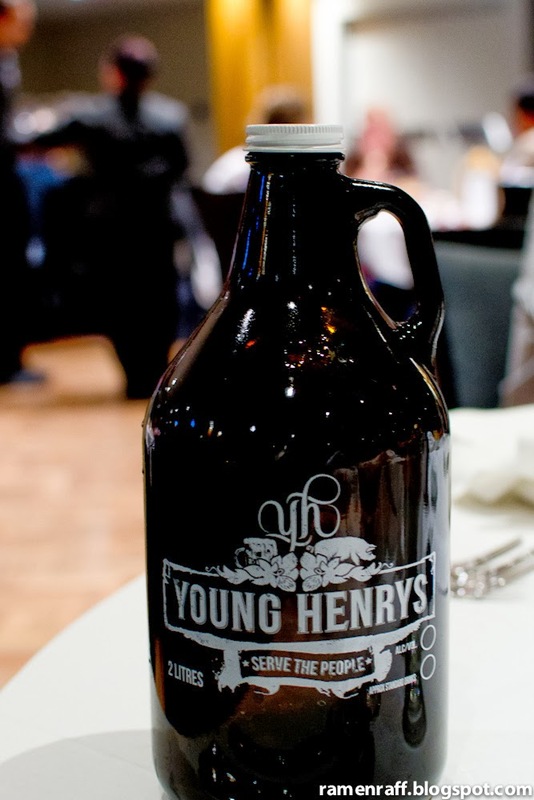 Young Henry's Real Ale is the real deal. 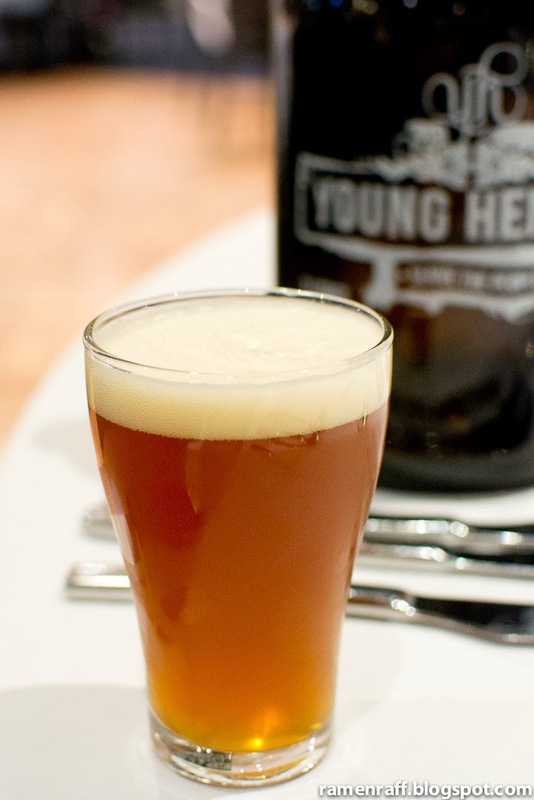 Dan of Young Henry's instructs us to sniff the beer before drinking it. Aromas of mango and passionfruit engulfed my sense of smell and the beer itself was smooth to drink with a light bitter after taste. 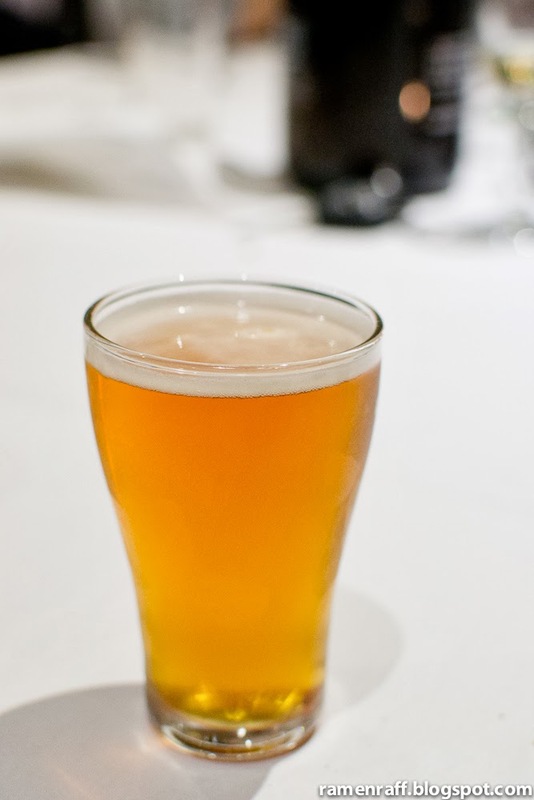 Once you've tasted craft beer like that, it's hard to have any other beer. 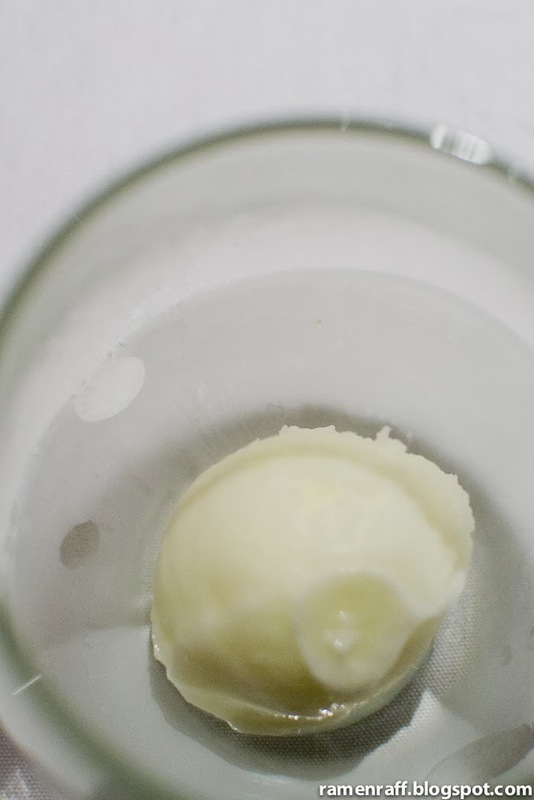 Chef Paul did an amazing job by using Pepe Saya's cultured buttermilk into a sorbet. It had a light sour creamy and zesty taste with a hint of tang. It was a nice and very refreshing break for the taste buds. 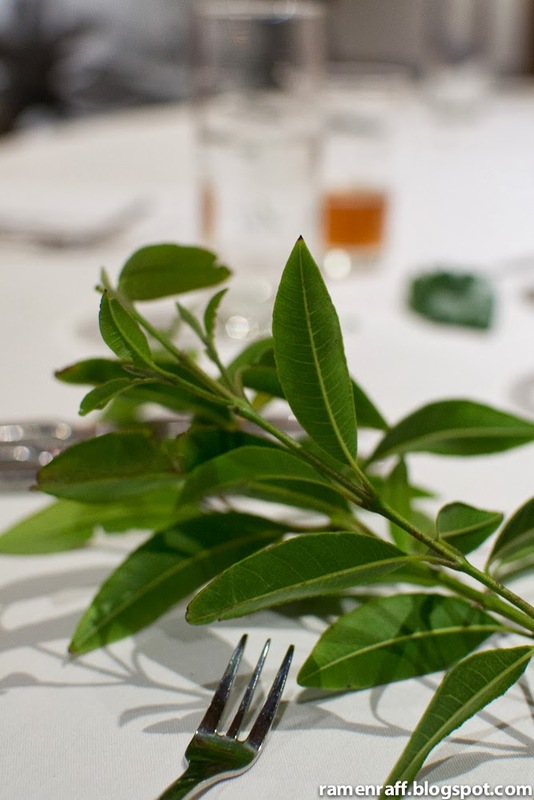 Chef Paul got us to crush fresh Lemon myrtle leaves to crush rub on our fingers and inhale to awaken the senses. The Glacier 51 tooth fish fillet from Fishtales was cooked to perfection. It had milky taste and a slightly moist silky texture. 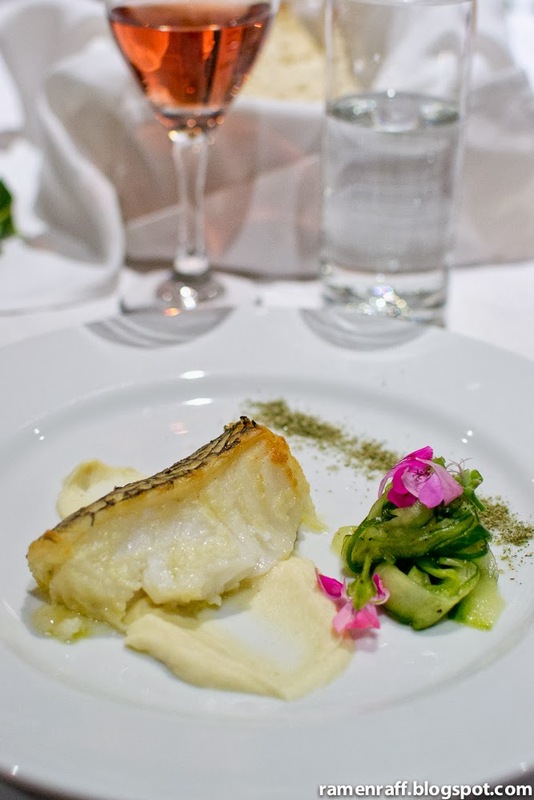 The sweet and creamy celeriac along with the pickled cucumber ribbons and lemon myrtle salt were nice accompaniments to the fish. 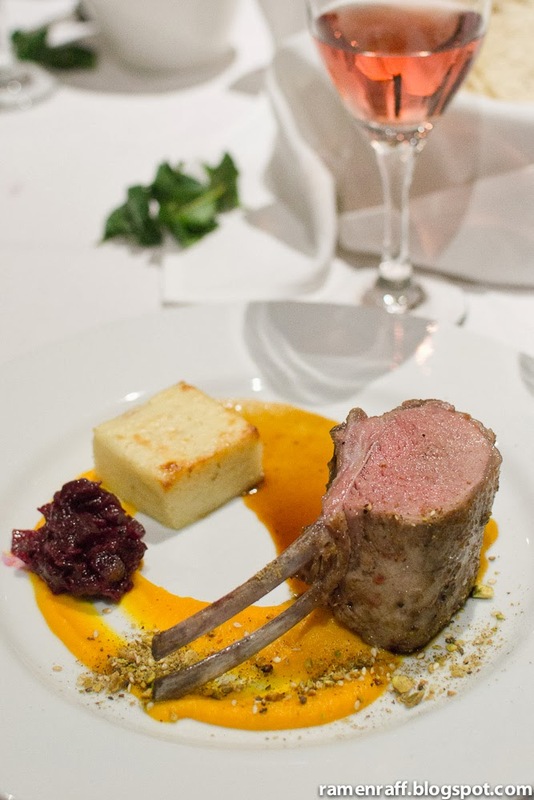 The New Season Riverina rack of lamb was cooked perfectly and was very flavoursome. The white polenta almost had the consistency of a tofu but with creamy innards. 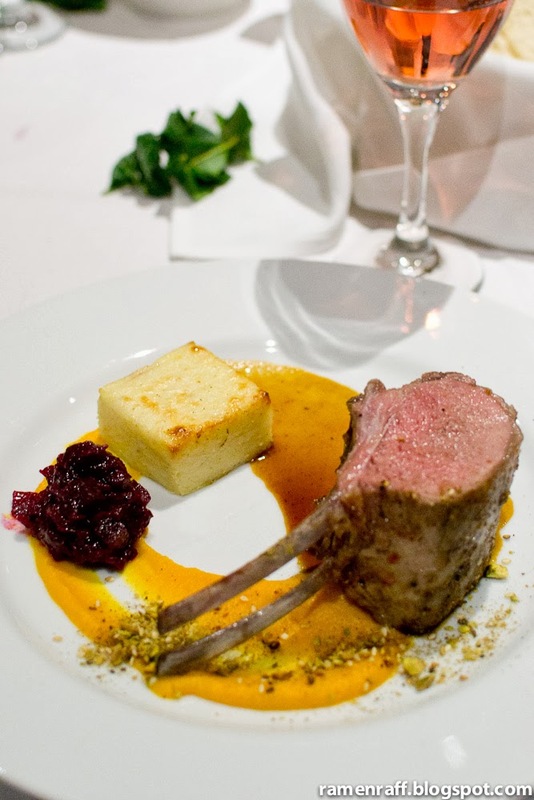 The pisctachio dukkha went well with the sensational creamy butternut pumpkin pureé. The beetroot relish was a nice touch to bring balance to the dish. The dessert tasting plate was nothing short of excellent. 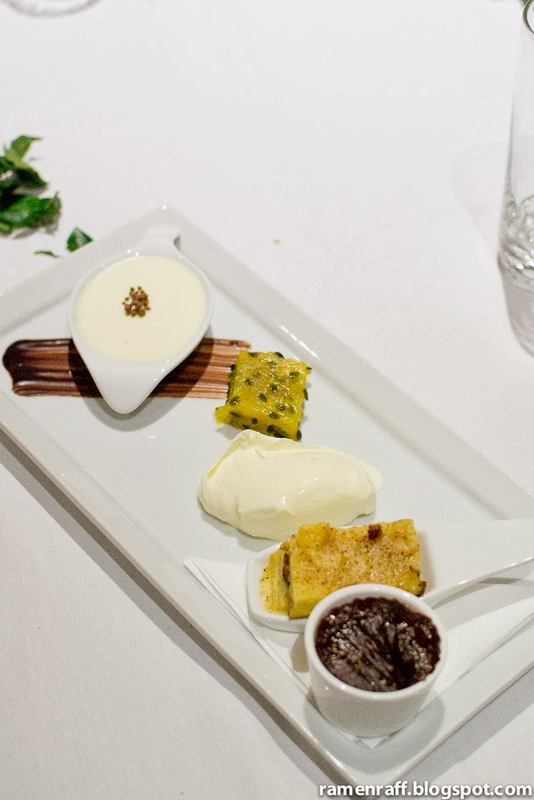 It had DessertMakers brioche bread and butter pudding, fig and ginger pudding, Pepe Saya mascarpone and Panna Cotta with lime and passionfruit jelly. Every component on this plate was exquisite and luscious. A Country Valley Milk cheese plate of caerphilly, Stefan blue and washed rind cheese with charred apricot and date loaf from Brasserie Bread was an awesome way of ending the night. 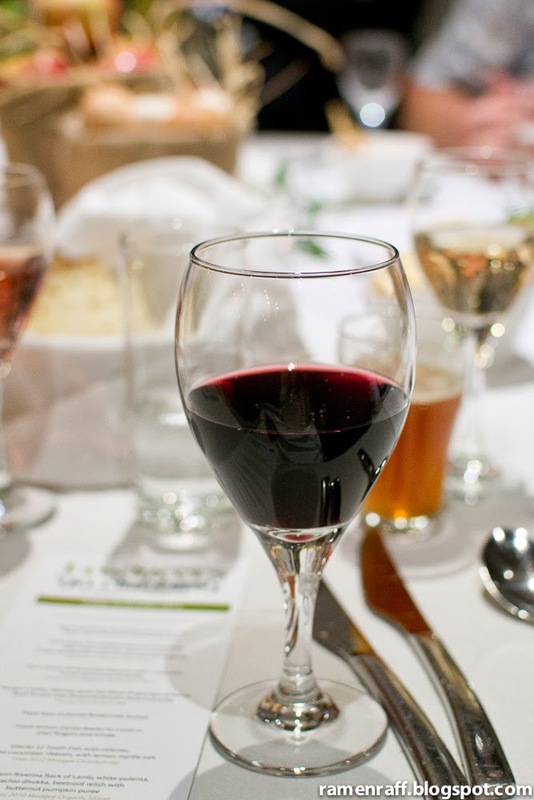 This was also paired with Young Henry's limited edition bacon and truffle beer. 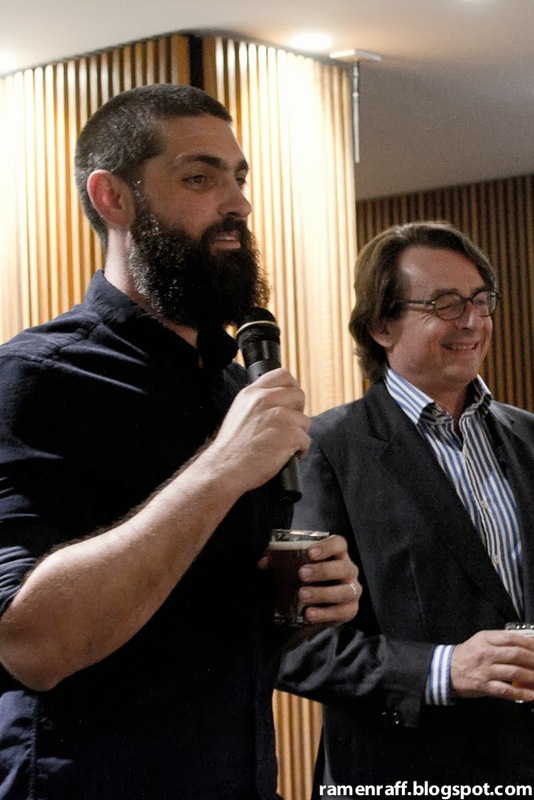 The beer was infused with smoked bacon and black truffle. 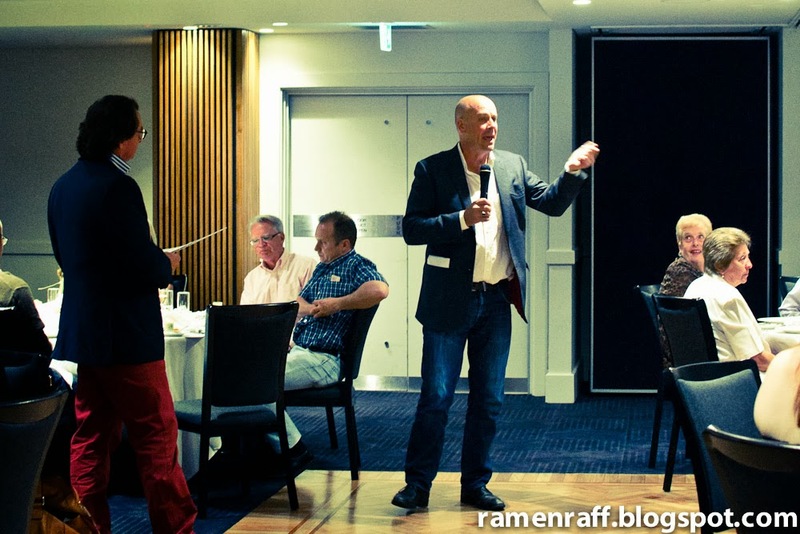 Ramen Raff dined at the Producers "Go Clubbing" event as a guest of Brasserie Bread and Campbelltown Catholic Club. As most of y'all know, I'm not just a ramen nerd. I am also a burger geek and addict. 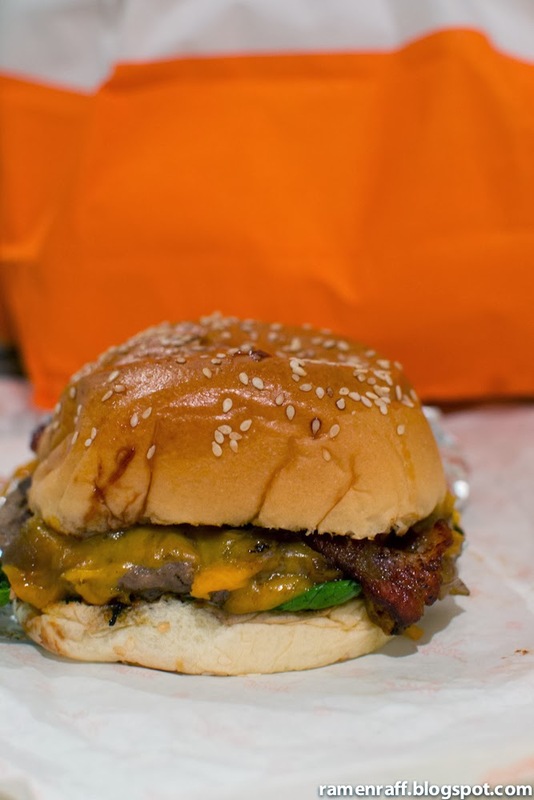 I feel adrenalin rush through my veins whenever I see a hamburger with soft bun, glistening juicy beef pattie, and a provocative melted cheese. Can I get a witness?!! 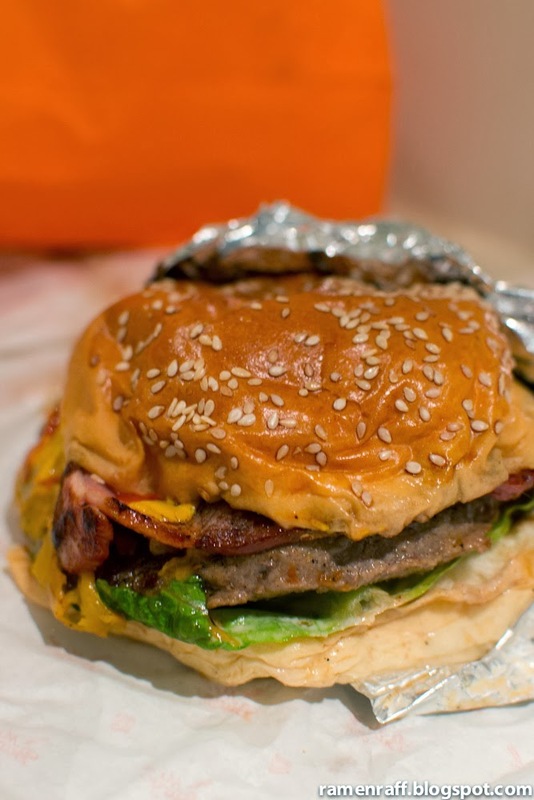 Anyway, I heard that the lovely city of Melbourne has amazing burgers of such to offer. So, I carefully mapped out my game plan and picked three places to visit. 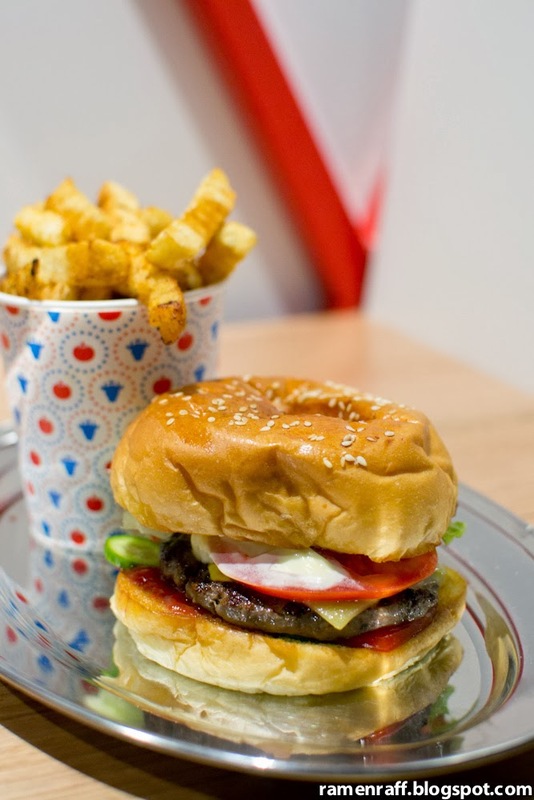 Namely: Huxtaburger, Mr Burger, and Rockwell & Sons Co. If the "Huxta" part of the name sounds familiar to you, then you must've watched or have heard of the "The Huxtables" whilst growing up. They are the renowned family of the sitcom "The Bill Cosby show". Even their burgers are named after some of the family members. 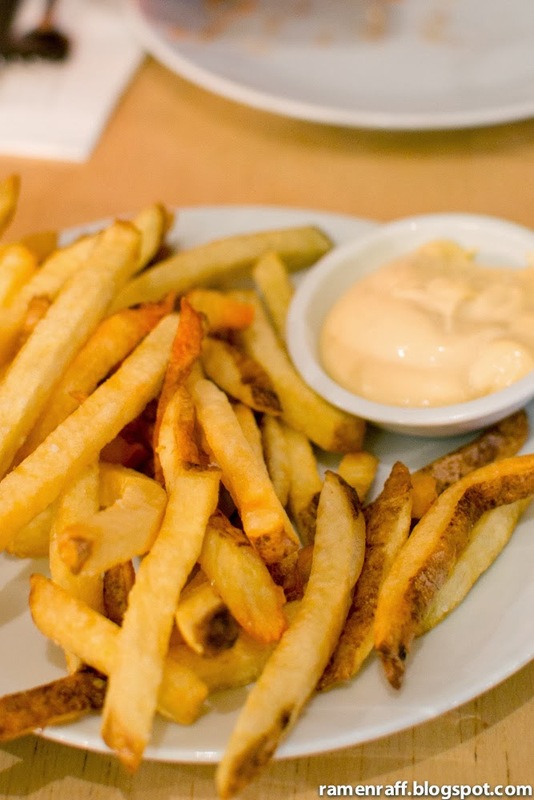 Such as Theo or Denise "the hot one" (a huxtaburger with chillies). 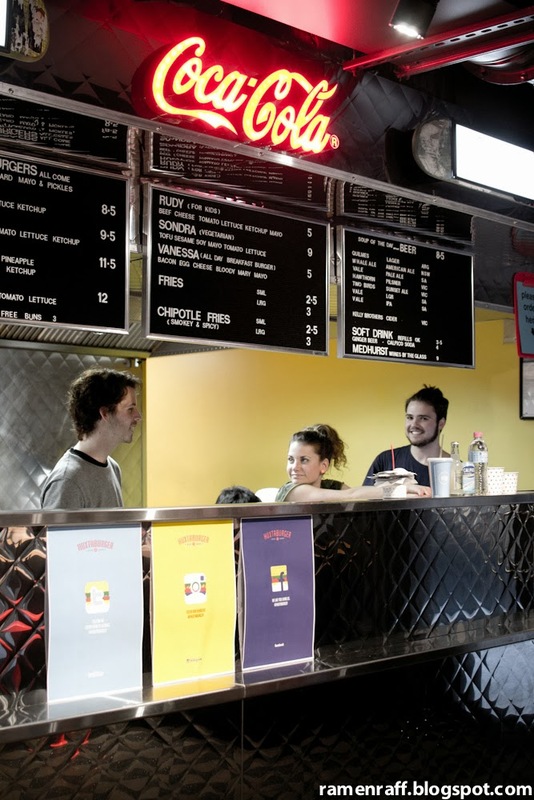 The first shop of Huxtaburger is located on Smith St in Collingwood. 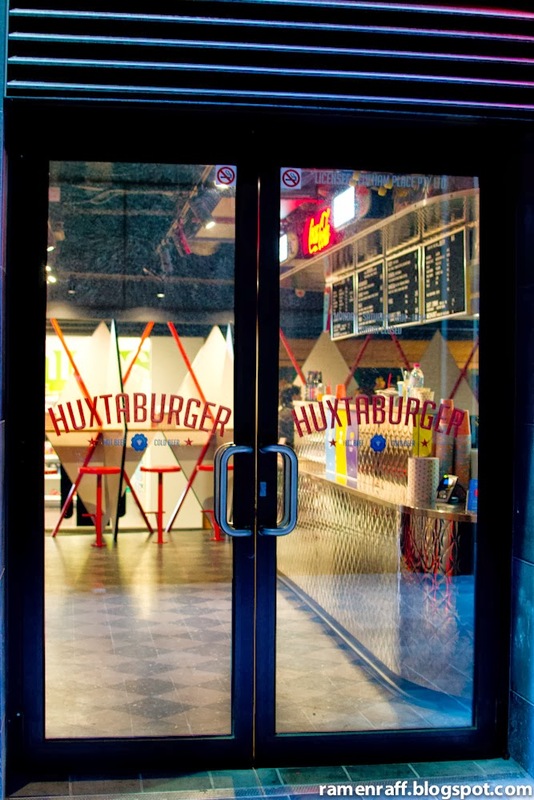 Then a few months ago, Huxtaburger II opened in the CBD. 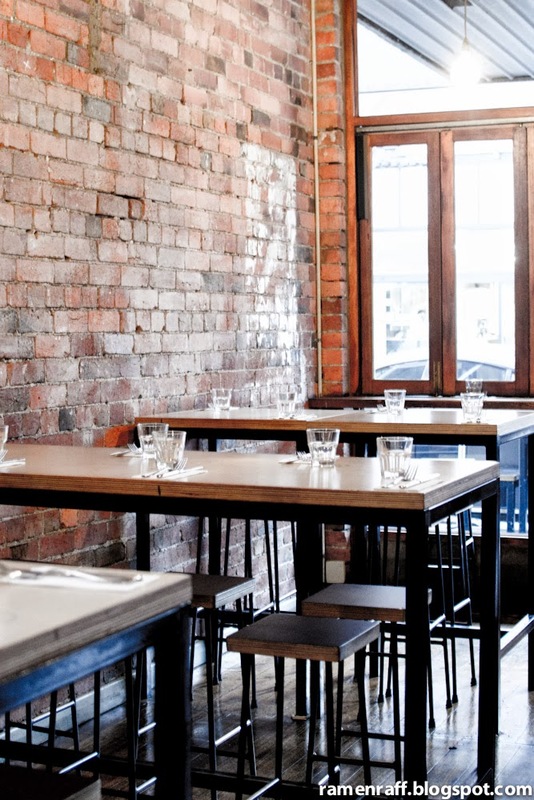 It is located in a laneaway (like most amazing eats in Melbourne) called Fullham Place. It had a diner type feel theme that is very fitting to the burgers they serve. My huxtaburger ($8.50) came out and the burger geek in me got super mega excited. The burger was somewhere borderline gourmet and dirty American burger in style. The melted cheese stared at me as if it was seducing me. The housemade bun was sweet and very soft. The bun was also buttered and slightly toasted that handled the whole burger well. The meat was perfectly flavoured. It also had lettuce, tomato, mayo, mustard, tomato sauce and pickles. This burger was so awesome that I had to order another one for takeaway and I went to their Collingwood shop two days later for another hit. 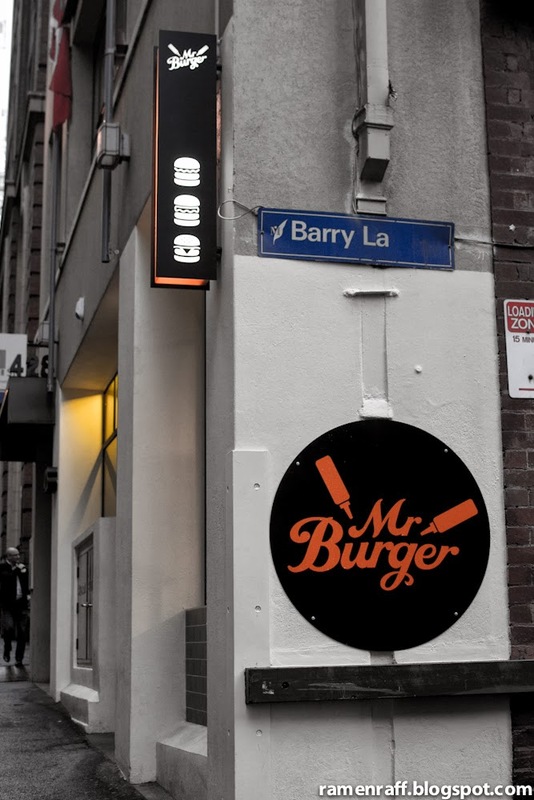 Mr Burger started as a hamburger food truck that would normally park in a warehouse near the Queen Victoria Markets. Mr Burger ($10) is a standard burger with beef pattie, cheese, tomato, lettuce, pickles, onion, tomato sauce, mustard and mayo. I requested for bacon as an optional extra. The sweet bun that handles all the ingredients is soft and tasty. The beef pattie is well seasoned. I preferred the Mr Meat burger ($11) to the standard burger. The barbecue sauce, bacon and caramelised onions gave this burger more punch with its smoky, salty and sweet flavours. It also contains beef, cheese, lettuce, pickles and mayo. 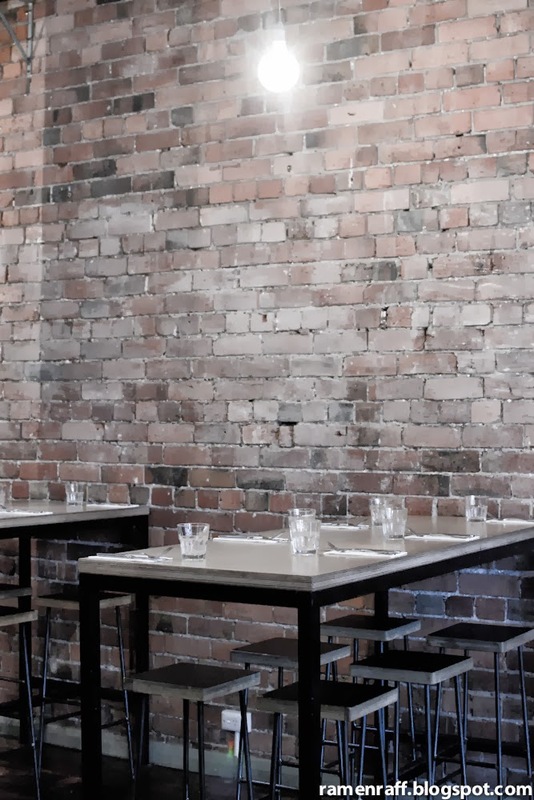 Another Collingwood joint that serves burgers goes by name of Rockwell and Sons. 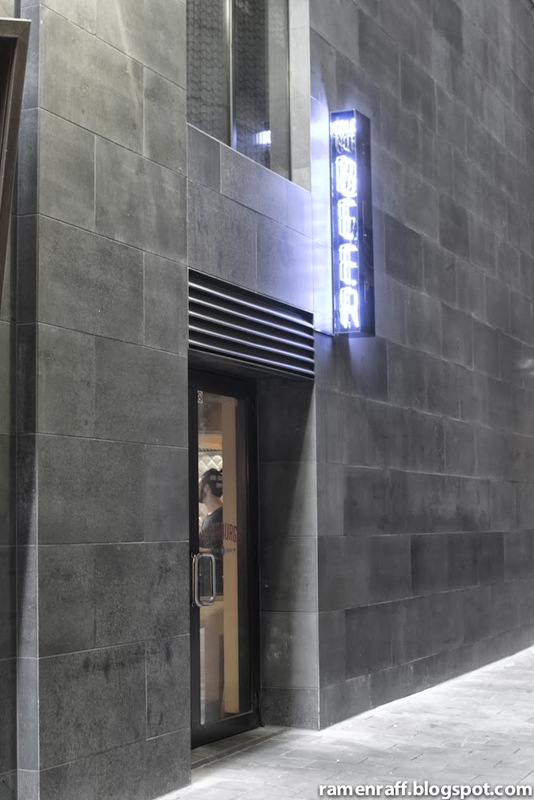 This American dude food and bar place is a smash hit amongst locals and visitors. 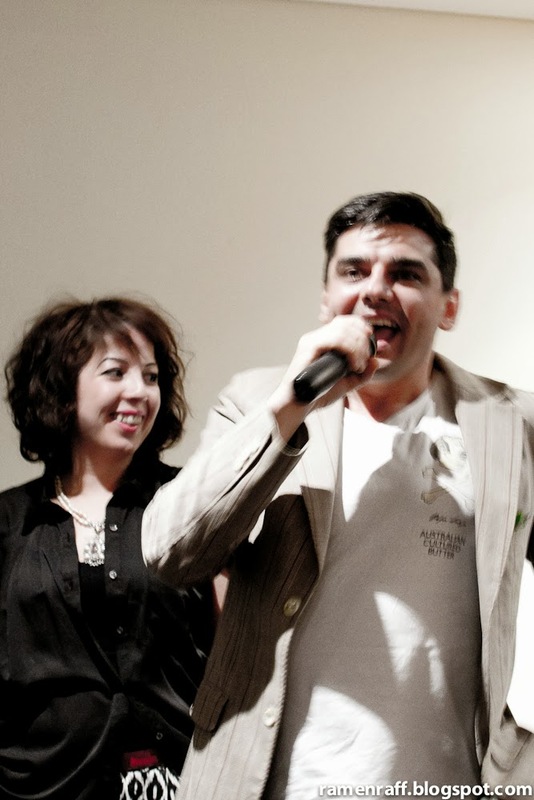 It is run by North Carolinian chef, Casey Wall and Kiwi chef, Manu Potoi. 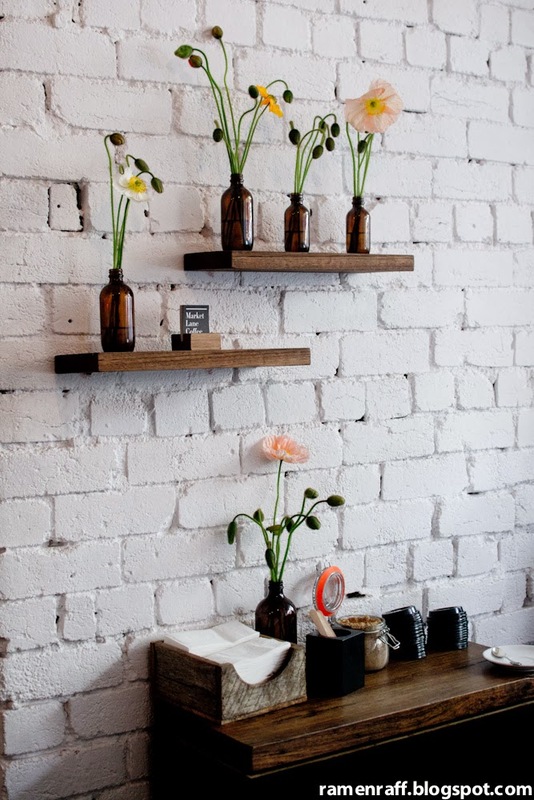 The place has a contemporary industrial small bar look. The service was fast and the staff were very friendly. I'm here for one reason only and that is to get my hands on the double patty smash burger ($10). It's called double patty smash as somewhere in the cooking process, the beef patties are flip and smashed in a way that it keeps some bits rare and some bits charred. 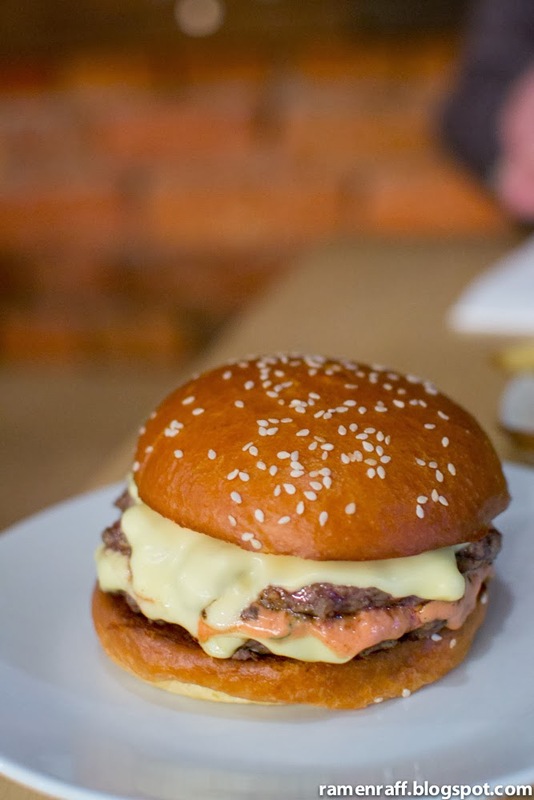 Two patties are then placed in a super fluffy and buttery seeded brioche bun. 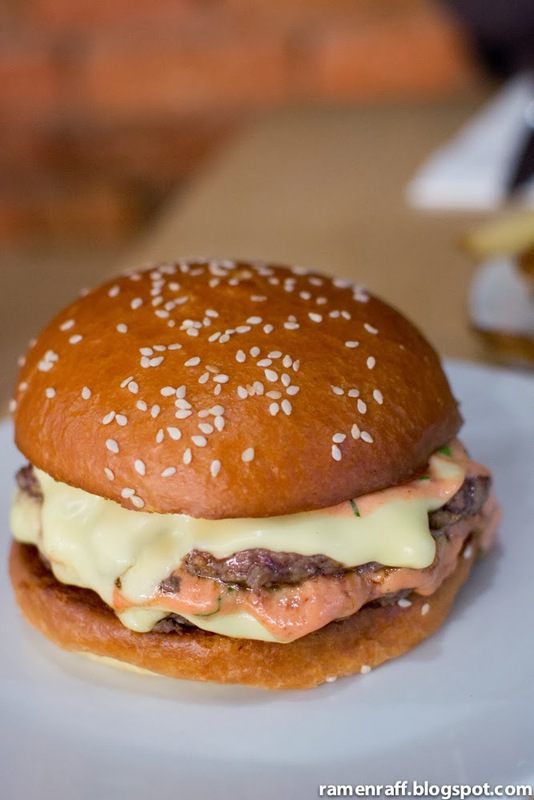 The whole burger is kept simple with alluring melted Kraft cheese and a special sauce. It is simple yet perfect and extremely flavoursome. 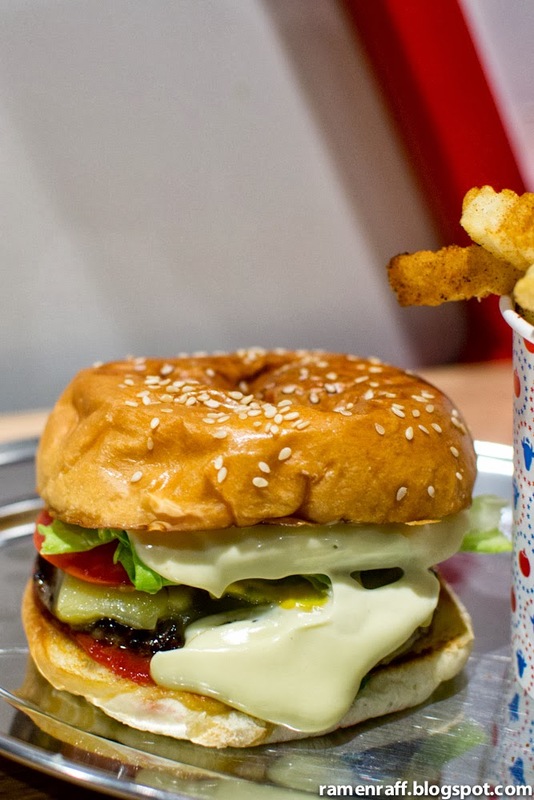 Melbourne is full of burger epicness that would more than satisfy any burger aficionado. This is only a glimpse of what this city has to offer. Welcome to the first of my BEAN There Done That series! Where the focus of my reviews is more on the coffee beverages. 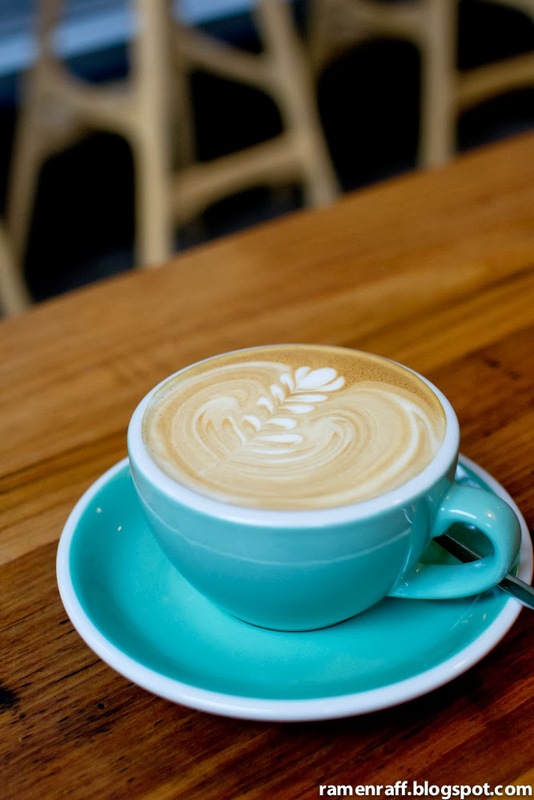 When I think of Melbourne, great coffee is what comes to mind. 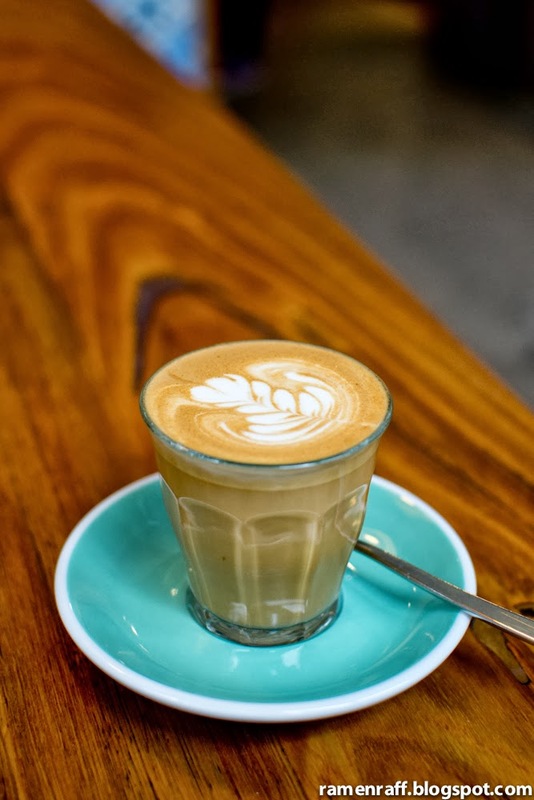 Everything I've heard and read points out to this lovely city being Australia's coffee Mecca (possibly the world). 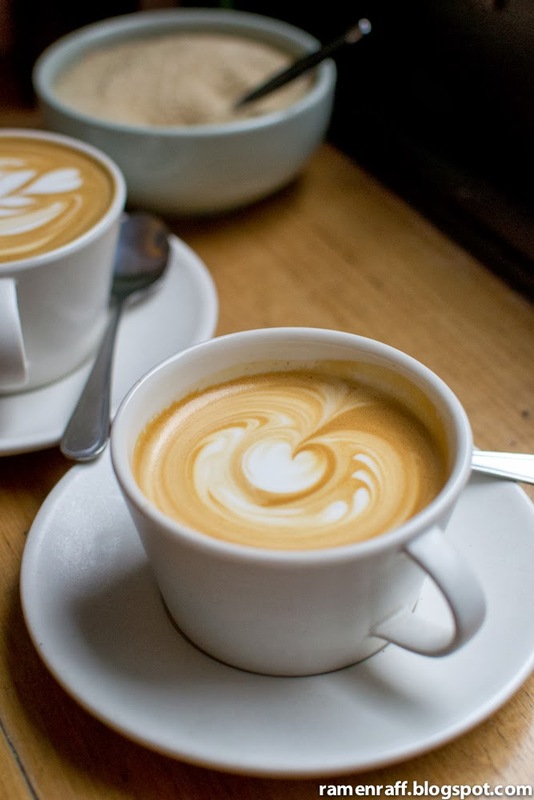 It's only in the last three years that I've come to appreciate coffee without the shot of caramel syrup or white chocolate in it. Now, a flat white or a piccolo latté are normally my choices. A drink called "magic" has also been added to this list and I will talk about it more later. 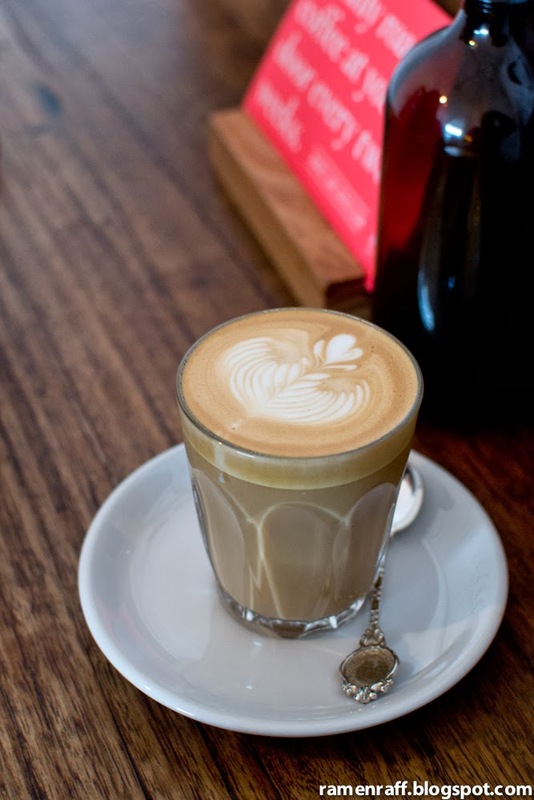 I have heard raves from many Melburnians of Patricia's coffee including a review I read from Ms. I-Hua's blog. 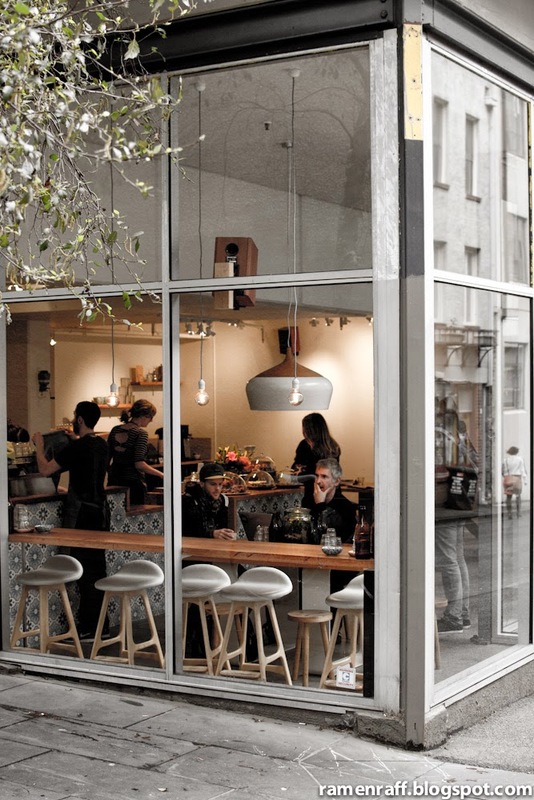 So I decided to get my first coffee hit from this "standing room only" café. Yep, I stood and sipped on my coffee like a hipster. It can get really packed so if you are claustrophobic, beware. 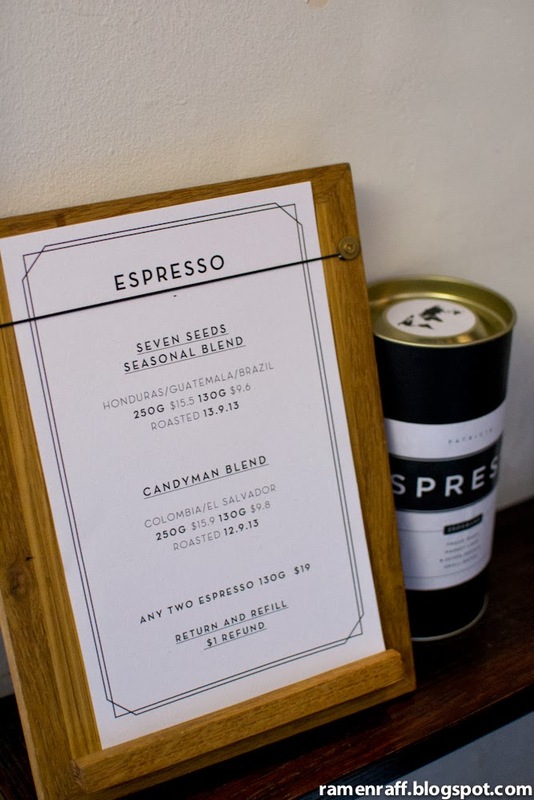 They source their beans from roasters like Seven Seeds, Proud Mary and Market Lane. I wanted my first coffee hit to be magical and so, I ordered Melbourne's coffee drink called "magic" (Yes, it's a real drink). It's not normally written on the menu and you just have to ask for it. Basically the coffee to steamed texture milk ratio is 1:4. It's either served in a 160ml cup with double ristretto and steamed milk or in a 200ml cup with double ristretto and 3/4 steamed milk. Here in Patricia, they do the latter. Expecto Patronum! The texture of the velvety steamed milk in my magic was amazing. As there is only 3/4 milk in this drink, I could really taste notes of nuts and milk chocolate embedded within the creaminess of the milk. I definitely enjoyed it. 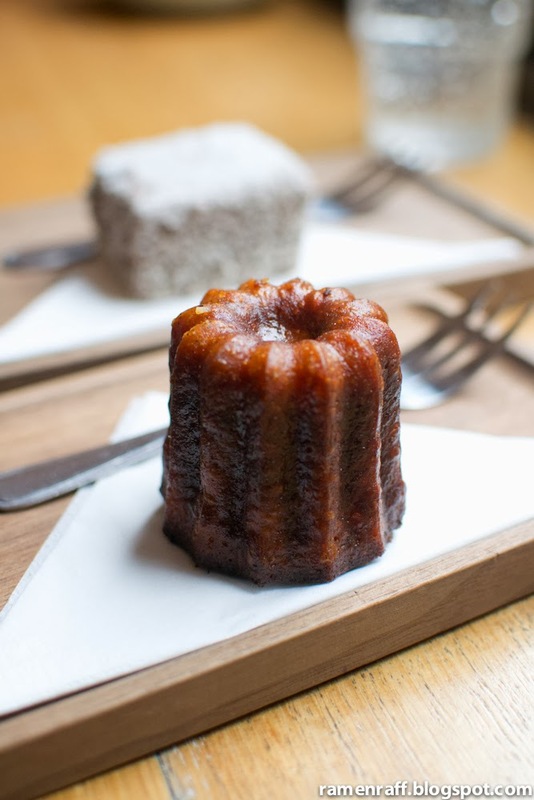 This was also the first time I've come across a French pastry known as canelé and I fell in love with it in an instant. It is baked custard with rum and vanilla. 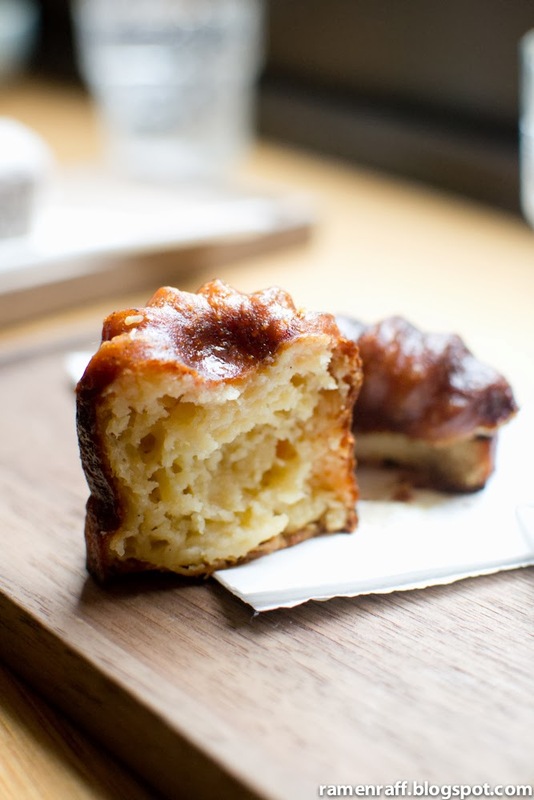 It has soft custardy innards with a caramelised outer layer. I could taste hints of rum from its caramelised layer. 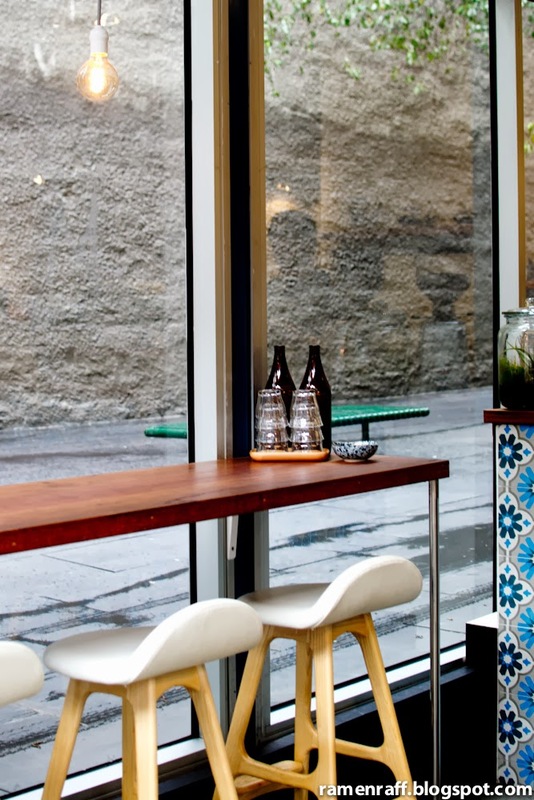 A Little bird is a new-ish cafe tucked within the laneway of Little La Trobe. 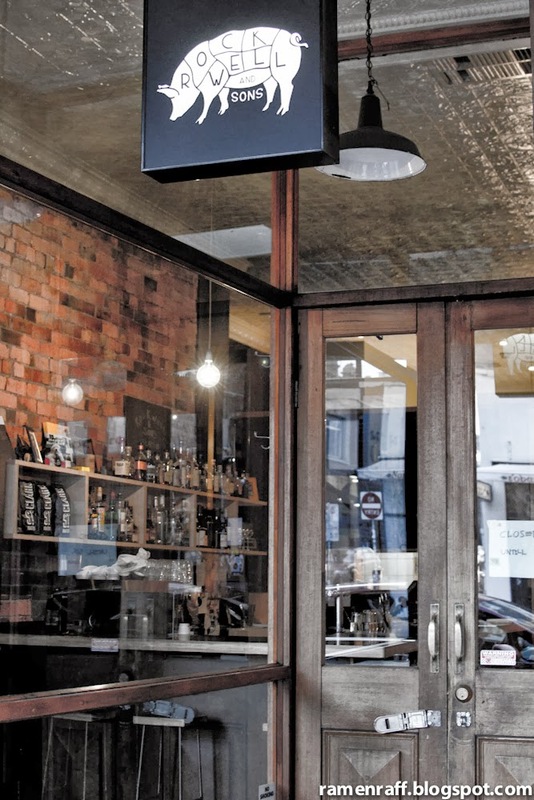 It is owned by Caleb Heaney (former head roaster at Seven Seeds) and Rebecca Notley. 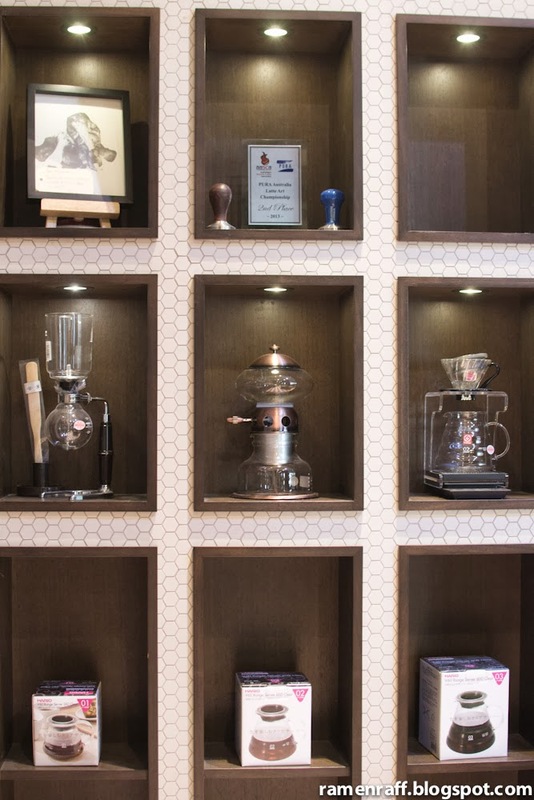 Mr. Heany is also a Q-grader accredited by the Coffee Quality Institute. The interior design by Rebecca is somewhat a cross between a studio gallery look and modern Scandanavian vibe. It felt like an escape from the hustle and bustle of the city within the city. 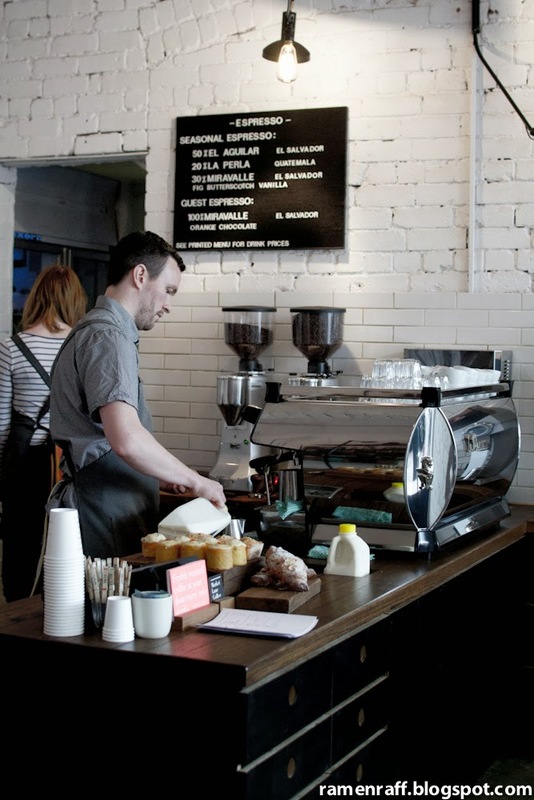 Caleb's vast experience in the coffee industry is very evident in the coffee served here. The milk on my flat white had a good texture and temperature. A Seven Seeds house blend was used for my drink. The body of the coffee was somewhere between medium to full and was a tiny bit on the fruity side. 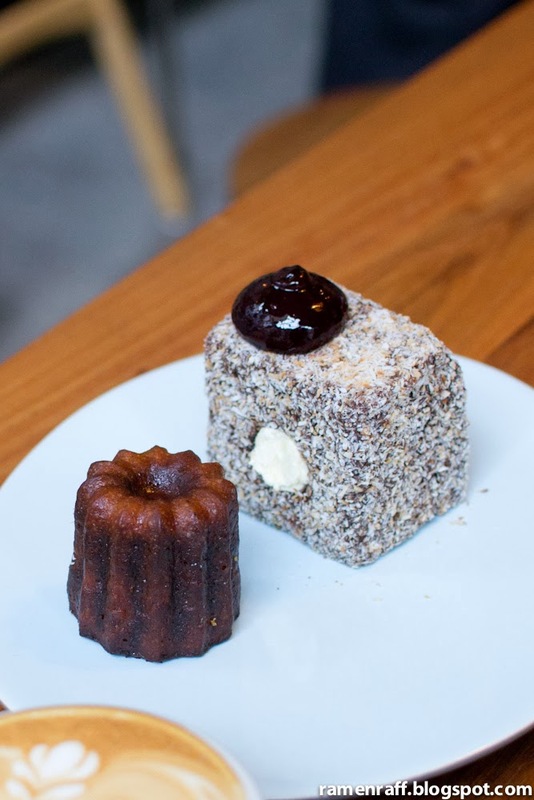 Since canelés were on offer at the counter, I cannot let the opportunity pass me by! 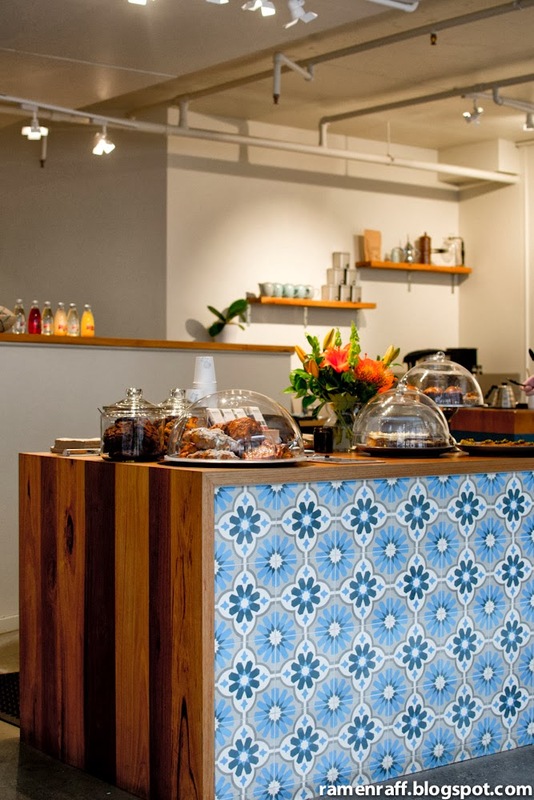 They only offer coffee and pastries/baked goods at the moment. Like their Facebook page or follow them on Twitter to get more updates. If you get your timing right, you might just be able to get your hands on their salted caramel donuts. 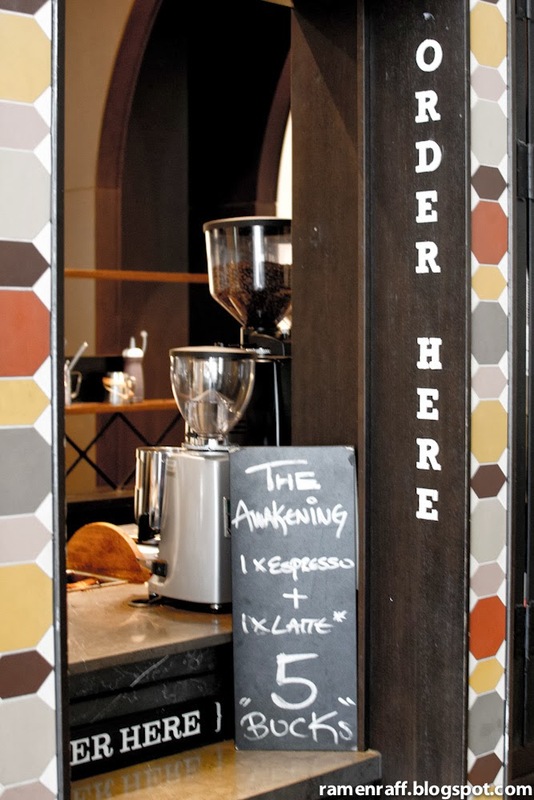 Market lane is another popular specialty roaster and coffee shop. I went for a quick stop at their store located across the Queen Victoria Markets. 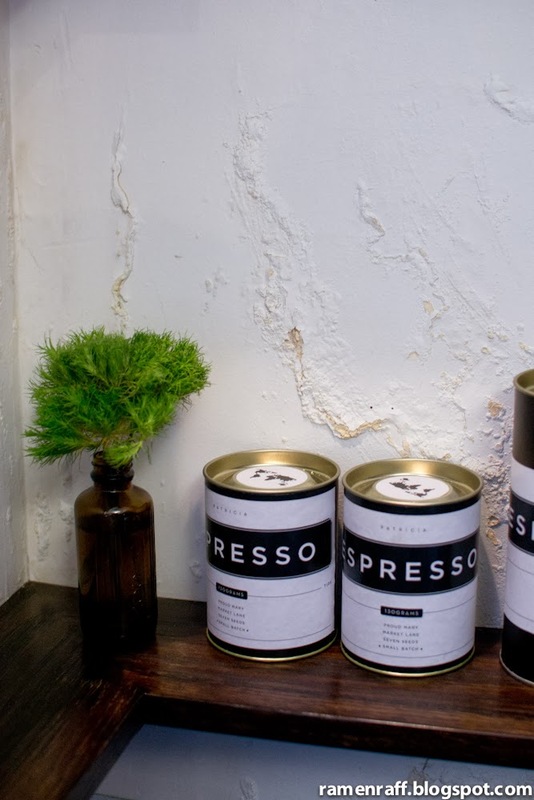 The shop is both a cafe and coffee retail store where they sell their blends and single origin coffee beans. 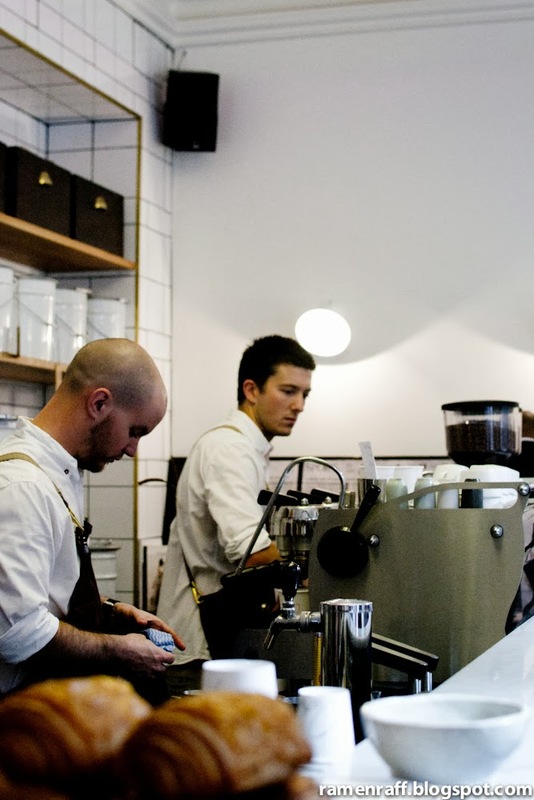 The cafe store had a classy industrial feel and staff members were also quite helpful when I purchased some coffee beans. As I was on the go, I went with a piccolo latté. As I took my first sip, I noticed the notes of fig and butterscotch from their seasonal blend coffee. I love it when notes of flavours cut through the milk. It just goes to show that the beans are of high quality. 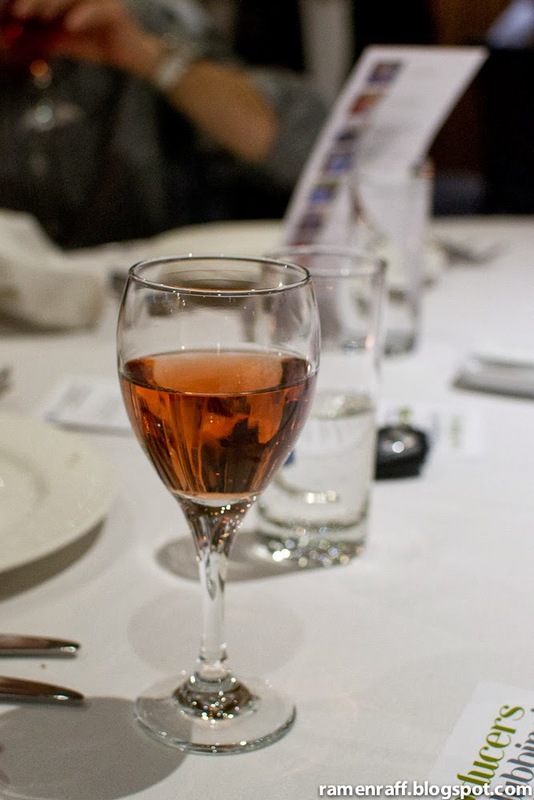 It had a medium body so it was very easy on the palate. 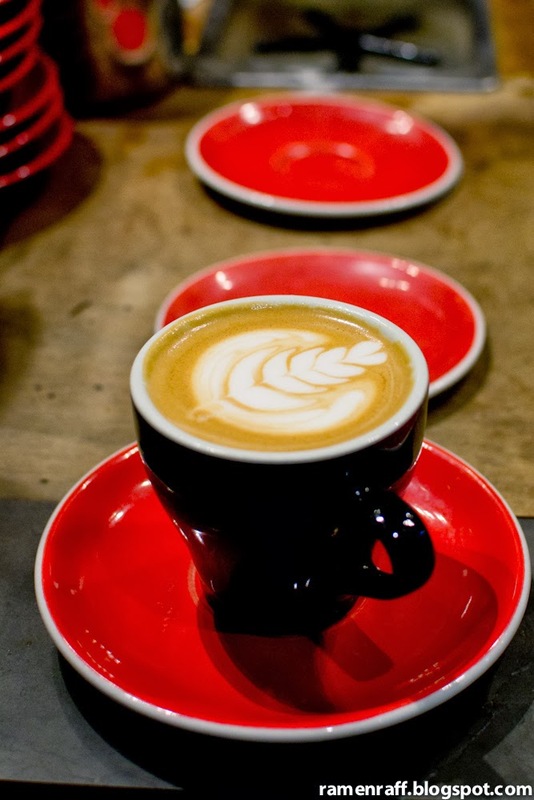 Last but not least is the awesome Plantation Coffee. 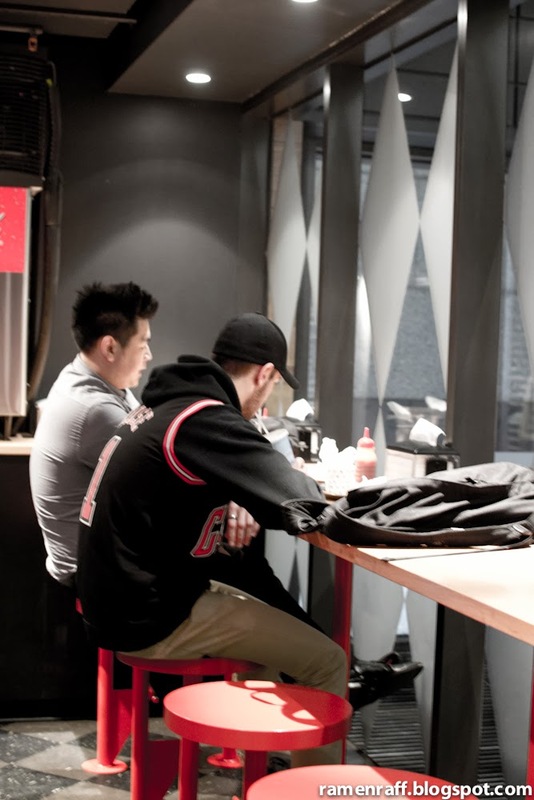 This joint is conveniently located on Level 2 of the Melbourne Central Shopping centre. 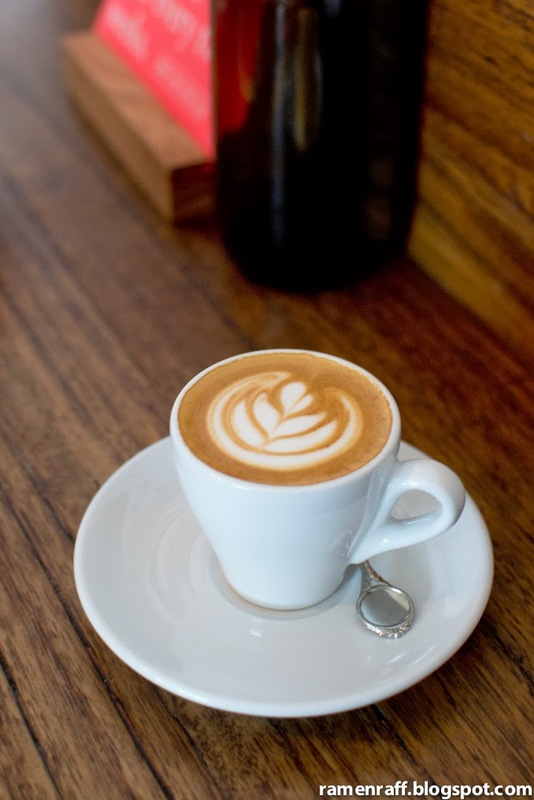 It is also the perfect spot for a coffee break from retail therapy! Plantation is brought to us by the people of Sensory Lab and is part of the St. Ali group. The beans are roasted by the awesome people of Sensory Lab and specially packaged for Plantation. 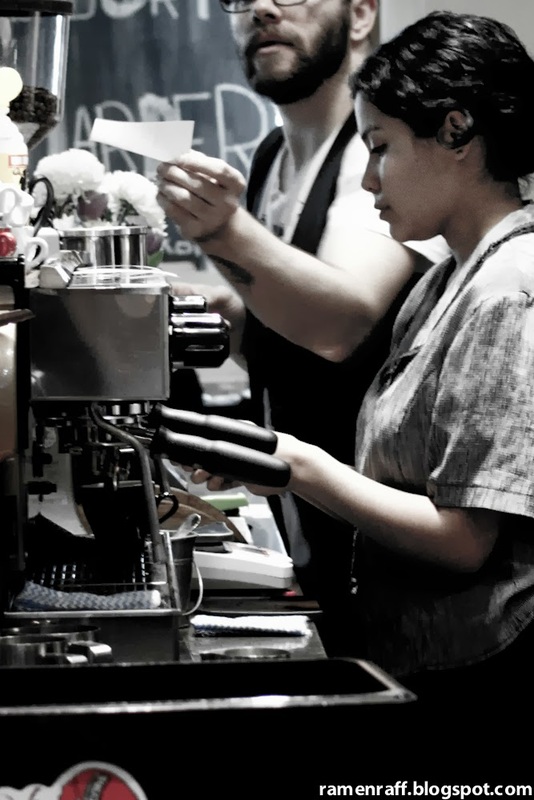 They are serious and passionate about their coffee. 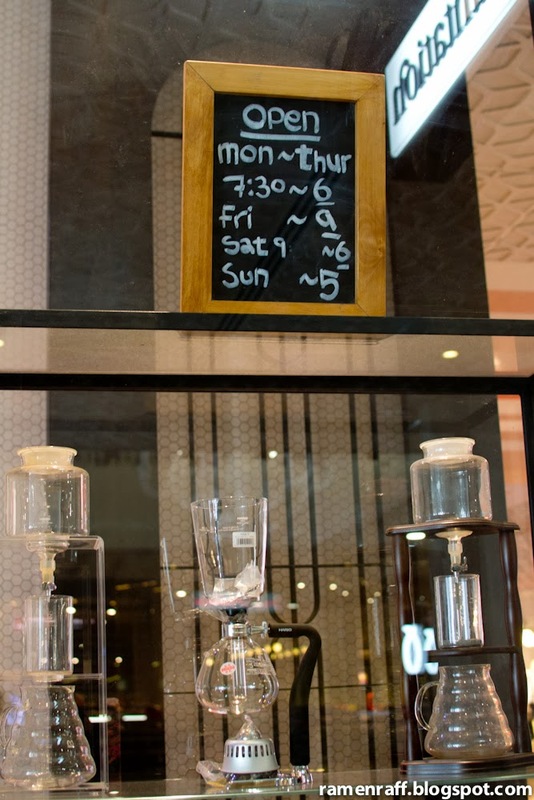 It is also a coffee retail shop that sells beans and coffee extraction gadgets. 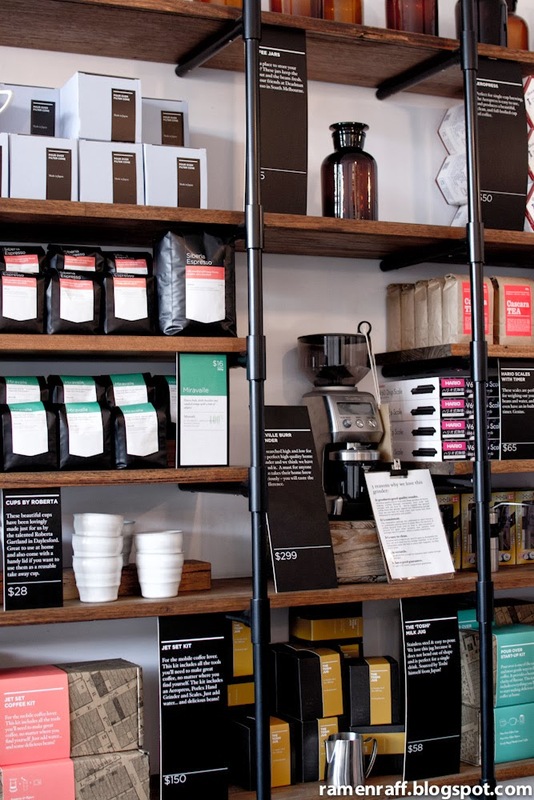 It is heaven to caffeine geeks like me! As it was the day before I left Melbourne, I opted with a cup of magic. It came in a 160-180ml cup with nicely textured steamed milk. 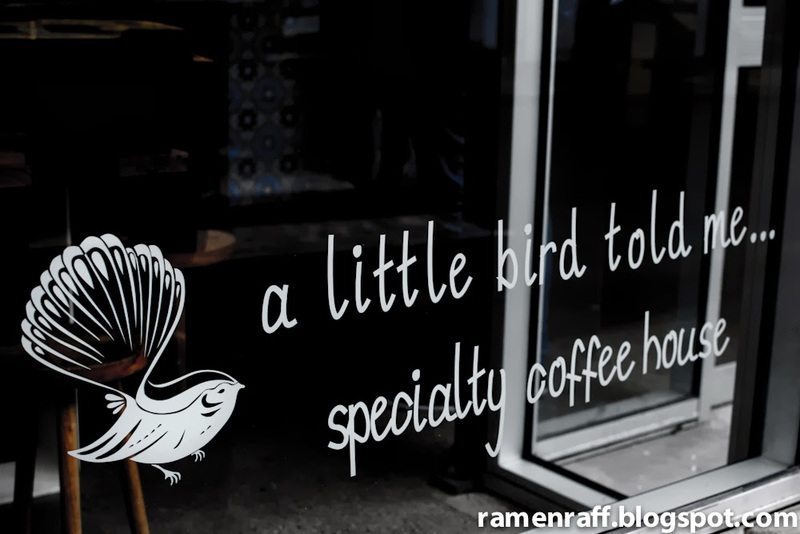 The coffee had a full body and was little bit sweet that cuts through the milk nicely. 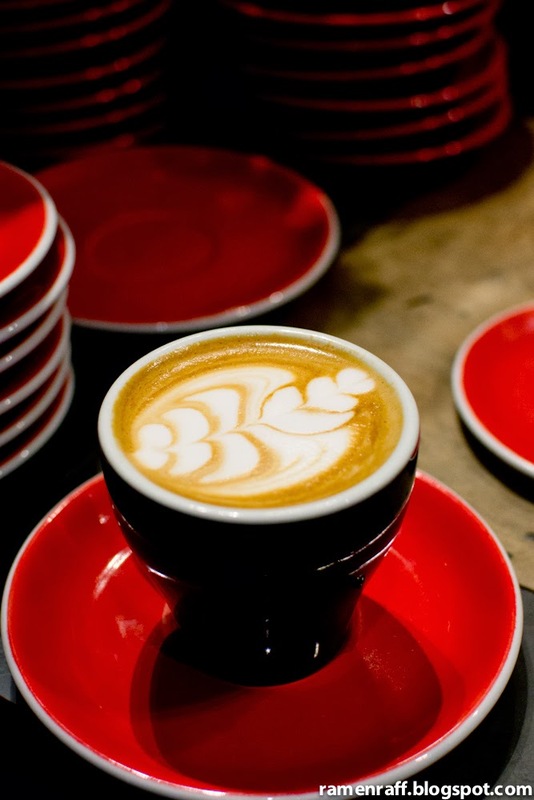 So does Melbourne really serve up amazing coffee as the hype suggests? 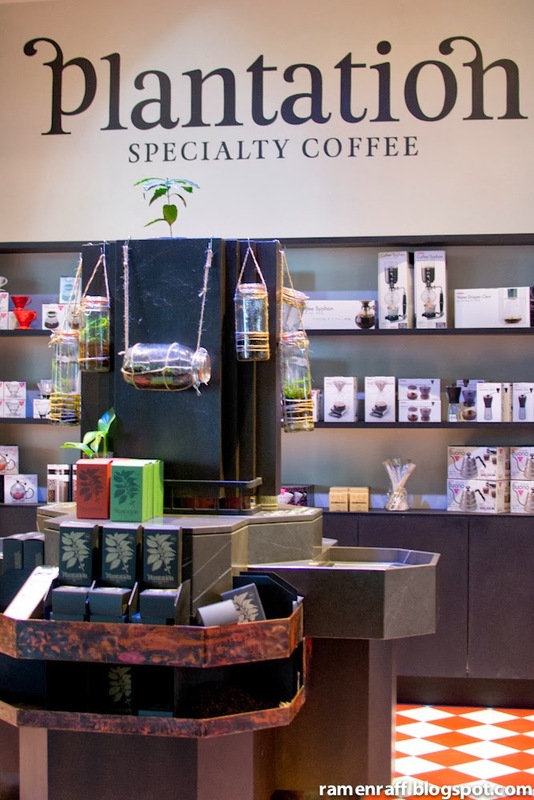 In my opinion, they definitely do sensational coffee with great passion and care.